So sometimes a really good technology just never really takes off. A USB TV Tuner is just one such technology. It should have taken off. Just about everyone who has a laptop should have one of these. I have three. So what would you use it for? In my case I live in a Hurricane zone and in fact got blasted by Hurricane Florence last year and had no power for several days. (Actually I had power because I have a full house generator). Anyway, due to a concern for the amount of fuel I had on hand I shut down at times and THIS is how I got my news during those times. This entry was posted in Blog, Linux, SDR, Software on March 22, 2019 by John Hagensieker. So you bought a cheap fridge or freezer at WalMart, did ya? Or maybe your old fridge or freezer conked out. The first thing that comes to mind is “THE COMPRESSOR IS OUT”! A scary thought indeed. And you think that because you don’t hear the compressor noise and nothing is cooling anymore. Compressors are pretty robust devices. They do fail, they sure do, but many times one of the components that connect to the compressor fail causing the compressor not to start. There are three components hooked up to a common refrigerator or freezer compressor. This entry was posted in Blog on February 28, 2019 by John Hagensieker. Appliances. We all need ’em. I’m all about high tech but there are some things that just don’t need to be high tech. Things like refrigerators, freezers, washers, dryers, and hot water heaters should last for DECADES, not a few years. Seems like there has been a rash of throw away appliances the last few years. I have several friends who bought fancy washers and dryers with computers onboard that dropped dead after a few years with expensive repairs needed to get going again. Meanwhile my washer and dryer that I bought in 2003 is still going strong with minimal repairs WHICH I DID MYSELF. If a washer has a tub, bearing, motor and timer switch it’s pretty easy to fix. If it is computer controlled with several boards under the hood……..you need specific training to fix it. AND YOU NEED THE MANUALS! I can’t stress enough how important it is to have access to the repair manuals. There are many parts web sites online that have complete Parts Breakdown and Service manuals. Also from those same pages you can order the parts you need. Old reliable appliances had SPARE PARTS made in droves. This entry was posted in Blog on February 23, 2019 by John Hagensieker. If you were to do an exhaustive search online regarding the subject of Swiss Army Knives (SAK) you would be prone to find lots of historical and technical details and there is a plethora of “What Is The Best Swiss Army Knife?” web lists out there. If you are a collector, or in my case a new collector, all of that information is GREAT! But it doesn’t explain WHY there is a connection between a boy or man and his pocketknife. First and foremost, it is a tool which grants you independence. I got my first knife (that I can remember) when I joined the Cub Scouts probably around 8 or 10 years old and in fact it is still in a drawer at my parents house. Man oh man was I proud of that knife. I’m sure as a Cub Scout I used it for whittling or to sharpen sticks when playing in the woods or maybe even used the screwdriver on my bicycle to tighten things up. I truly get the emotional connection when a young boy gets a hardened steel knife. It’s DANGEROUS and by golly you were entrusted to operate it responsibly, and to use it as a TOOL and a LIFE SAVING DEVICE as any good scout is taught. You are MAN ENOUGH to have something hazardous, maybe for the first time ever. This entry was posted in Blog on January 7, 2019 by John Hagensieker. I’ve loved pocketknives ever since I was a Cub Scout and got my first real pocketknife which looked something like the knife below. It had a SCREWDRIVER which I guess made it my first multi-tool. Now I’m not into knives or blades, have no desire to cut anyone or myself but the concept of carrying around useful tools in your pocket has always fascinated me and it maybe did come from scouting where they taught you to always be prepared. This entry was posted in Blog on November 25, 2018 by John Hagensieker. The goal in geekdom is to always advance the skills but we should NEVER forget where we came from and re-visiting it from time to time is nostalgic and cool to the up and coming geeks. One particular rite of passage for being a geek is taking an Altoids tin and doing something geeky with it. Here’s my favorite project and then right after showing this I’ll go further back into my geek roots with my first Altoids tin project. This entry was posted in Blog on October 31, 2018 by John Hagensieker. Ok…..This started innocently enough. 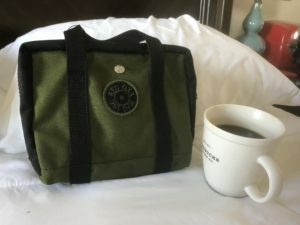 I’m into short wave radio and saw a website where a guy had a little cloth bag that looked kind of sort of military in style, and looked very durable. He used the bag for a radio, power brick, antenna, etc. As I was looking at that picture I kept keying back in on that bag………..so I emailed the guy and said “what bag is that”? Red Oxx was the reply. So I ordered one of these bags which was called the Lil ‘Roy. And wow is this thing ever built great! So I used it for the shortwave radio and then this cute gal around the corner needed something fixed. So I’m looking and looking for something to carry my tools in and then it hits me. Lil Roy is a tool carrying machine! This entry was posted in Blog on October 13, 2018 by John Hagensieker. I guess it is ftting that my first entry on this new blog would be on the platform I’m posting it from. WordPress. For years I have used something called Rapid Weaver, which is awesome, and Rapid Weaver also has a blogging plugin called Armadillo which is very WordPress-like. Still, you know me, I have to dabble in everything. This entry was posted in Blog, Software on April 26, 2018 by John Hagensieker. Keen focus on Raspberry Pi, Ham Radio, Software Defined Radio (SDR), Network Devices and various other blunt objects which can be thrown when not working correctly.